Hello, I am a member of my HOA board and am researching the possibility of filling in our floodplains with wildflowers. Currently the floodplains are grass only and span a few acres. Our goal is to try to make it similar to what is seen along the interstate and our questions are: 1. Can this have a negative impact on the home owners nearest to the fields, ie, will the homeowners be fighting "weeds" because of the wildflowers' natural reproduction? 2. How would we go about sowing wildflowers over such large areas? Do we just get a spreader and disburse it or would the land need to be tilled? Do you have any idea what the cost may run per acre? 3. How long do wildflowers tend to stay in bloom? 4. Will we be able to mow them down without killing them once they no longer are in bloom? 5. Does the wildflowers height attract snakes and rodents that might be a nuisance/danger to nearby home owners? 6. Would wildflowers do alright in floodplains? Our biggest one doesn't normally ever end up under any layer of water except for maybe once a year for 30 minutes or so during an extremely heavy downpour but then quickly drains. 7. Finally, do/can wildflowers play a significant role in stopping soil erosion? Thank you for taking the time to respond! 1. Can this have a negative impact on the home owners nearest to the fields, i.e., will the homeowners be fighting "weeds" because of the wildflowers' natural reproduction? Seeds from some of the wildflowers are likely to show up (distributed by birds or the wind) and grow in neighbors yards and flowerbeds, but there shouldn't be vast numbers and the flowers they produce might be something the homeowners would like to have. If you do have to till the soil (see the answer to #2 below to determine whether tilling will be necessary) to sow your wildflower seeds, this could bring up weed seeds and stimulate them to germinate and grow. The seeds that these weeds produce could find their way by wind or other means into homeowner's property—certainly, a negative effect. Probably more of a negative impact, however, is the fact that in order for the wildflowers to continue from year to year it will be necessary to wait until the majority of them have set seed before the areas can be mowed. There may be a period of several weeks when the fields look a bit "untidy". 2. How would we go about sowing wildflowers over such large areas? Do we just get a spreader and disburse it or would the land need to be tilled? Do you have any idea what the cost may run per acre? The Wildflower Center, in its How to Articles, has several articles that can help you plan and create your meadow garden—for instance, see A Guide to Native Plant Gardening, Meadow Gardening, Recreating a Prairie and Roadside Planting. In particular, read "Soil Preparation" in A Guide to Native Plant Gardening. This section will help you determine if you need to till the soil before you sow seeds or if you can use other means to prepare the soil for your wildflower seeds. You can find individual wildflower seeds and wildflower seed mixes for sale at Native American Seed in Junction. They give you estimates of how much area various seed amounts will cover so that you can determine the cost of your project. They also have excellent Planting Tips. The Planting Tips feature on Native American Seed website, as well as the How to Articles listed above, offer several suggestions for distributing the seed. 3. How long do wildflowers tend to stay in bloom? Any particular species may bloom for two to three weeks, but some species continue to bloom over longer periods. What you will want to do is to choose several species that bloom at different times of the year—early spring, late spring, summer and fall—so that you have interesting flowers blooming over much of the year. 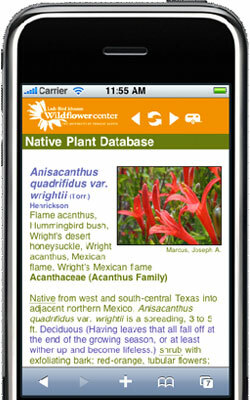 You can check bloom times in our Native Plant Database. Also, you will want to pick species that do well in your area. A good place to start looking for them is in the Special Collections—North Central Texas Recommended and in the Cross Timbers and Prairies lists. In these databases you can use the NARROW YOUR SEARCH option (in the sidebar) to sort the plants by bloom time as well as other characteristics of interest. In fact, you should consider the growth factors that will affect the areas in question—for example, amount of sunlight/shade and soil moisture. You can use NARROW YOUR SEARCH for the appropriate choices under Light Requirement and Soil Moisture. 4. Will we be able to mow them down without killing them once they no longer are in bloom? If you allow at least half the late-blooming species to set seed before you mow, they should survive just fine. Read the Meadow Gardening article for more information about mowing your meadow of wildflowers. 5. Does the wildflower's height attract snakes and rodents that might be a nuisance/danger to nearby home owners? The heights of the growing wildflowers should not be a particular attraction to snakes or rodents. Piles of debris or trash for them to hide and nest in would be a problem, but not growing grasses and wildflowers. 6. Would wildflowers do alright in floodplains? Our biggest one doesn't normally ever end up under any layer of water except for maybe once a year for 30 minutes or so during an extremely heavy downpour but then quickly drains. If the water does drain away quickly, the wildflowers should do just fine. Water that remained for a long period of time (e.g., a day or two) could negatively affect some species. Water that moved swiftly across a field of flowers could also affect some species by flattening and/or breaking stems. 7. Finally, do/can wildflowers play a significant role in stopping soil erosion? Plant roots, especially fibrous ones, help hold the soil in place and prevent erosion. Many wildflower species have reasonably fibrous roots. Grass species have significantly fibrous roots and are excellent plants to go with your wildflowers. Together they will have a significant effect on preventing erosion. Please be sure to read what the Meadow Gardening article says about the mixture of grasses and wildflowers for a meadow planting. Plants for a sandy slope at a weekend cabin in central WI.